Making vegetables in the Lunchbox – Simply delicious! Summer is finally here!! We can finally take a break from the school run – getting the kids up, washing their uniform and of course making those all important school lunches. But of course, there’s still those Summer Family days out, and making your own lunches can save money on expensive lunches. Our friend Jenny Tschiesche at Lunchbox Doctor, is one of the UK’s leading nutritionists. Here she shares some of her yummy, simple and healthy ideas for your kids’ lunchbox that you can take away for those Summer days out and ready for the school runs in September. “Statistically one of the hardest elements of a nutritionally balanced lunchbox for parents to achieve is the vegetable portion. According to the latest statistics[i] on this subject just 1/10 lunchboxes has a vegetable portion in it. Here, Jenny Tschiesche, also known as the Lunchbox Doctor (www.lunchboxdoctor.com) will share her ideas for making the vegetable portion of the lunchbox a little more interesting than some soggy, tasteless carrot batons. They may not all be to your child’s liking but some may be and by finding ideas that inspire them you are forging great habits for your children as they reach teenage and adulthood. Pizza on a stick – using a cocktail stick or cut-off straw thread on cherry tomatoes, Mozzarella balls, ham and repeat. Soups – add lentils for thickness and protein. These can be served in a mini Thermos flask and eaten at school whilst still warm. Sugar snaps are delicious dipped into some sweet chilli sauce. Try packing mini versions of vegetables – baby beets, mini sweetcorn, cherry tomatoes. The size difference is sometimes enough to keep children intrigued. This is a great alternative to sandwiches in a school lunchbox. The kids love it because it tastes so cheesy. It’s full of goodness from the wholegrain oats, to the vegetables and the protein from the eggs. It is designed to help your children concentrate on the afternoon’s work ahead. Preheat the oven to 190ºC (375°F). Line a square shallow baking tin – about 20cm long. Place the mixture into your lined baking tin and cook for 25 minutes until golden brown. Cut into pieces and leave to cool before trying to remove from the baking tin. 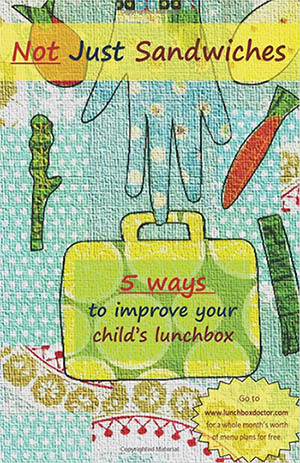 You can find more great ideas on the Lunchbox Doctor website! Why not enter our new Twitter competition? 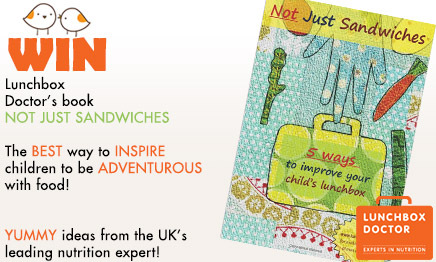 Jenny has given us 2 copies of her book, “Not just Sandwiches: 5 Ways To Improve Your Child’s Lunchbox” to give away! Pop over to our Twitter to find out on how to enter!